You must know by now that I love antiques and the thrill of finding a small treasure or two when I'm perusing a shop is always fun. If I'm in the Los Angeles area I have to make a quick stop at the largest antique store in the state. Located in the charming town of Whittier, King Richard's Antiques has over 47,000 square feet of merchandise from about 260 dealers on three separate floors. One can find fine silver, linens, kitchenalia spanning many decades, furniture from several periods and many other unique items all in one space. I'm always amazed to find certain pieces of 'stuff' that I clearly remember growing up with, mixed among items that I truly covet. A few days ago I walked in there with my younger brother because we were in the area. I knew I wanted to capture images for everyone to see, so I made sure to ask for permission before I started photographing. My time was limited and I tried to get as many pictures as I could, while keeping an eye out for things I found interesting. I came across some nice objects that I simply could not walk away from, yet there were others I found to be beyond my price range. One of the things that I truly love about King Richard's is their friendly staff. Not at all stuffy or aloof, but helpful and willing to answer all of your questions. Like any good antique shop, this store clearly tags every item with the dealer's number, along with a description of the piece, and of course, the price. Many things are locked behind glass display cases and one has to ask for help if there is something which needs closer examination. The entrance to the store. As one walks in, the items are bright, cheerful and neatly arranged. The diner set in this photograph would look nice in a small apartment or an eat-in kitchen with its black & red chairs. More furniture, paintings and even a large, oversized winged horse from a Mobil gas station greet visitors. I fell in love with this pair of old apothecary jars with wooden lids, but in the end I did not buy them. I can see these in a country kitchen or one with Shaker sensibilities. Mid-century Pyrex bowls in primary colors are quite lovely (these were in mint condition). 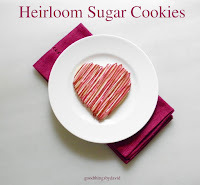 The charming set can be at home in most kitchens and will be cherished by anyone who owns them. I zeroed in on this glass case because I noticed several salt cellars. As I gave them a quick look, I realized I already owned these shapes, so I passed them up. Have a look at what I do have by clicking here. I almost bought some of these linens. Bundled in sets, the cocktail, luncheon or dinner napkins can grace any table. I make it a point of examining the needlework, hemstitching or embroidery to see if it's held up well over the decades. I then look at the overall state of the linens and check for stains; if they're too problematic, I leave them. Here's an overview of the main floor. There are 4 aisles with numerous vendors here. A lot of kitchenware from the 1800s through the 1960s or so can be found in this area. You really have to keep your eyes peeled for them, because they may be hidden behind a cabinet or other pieces. This is one of the thrills of antiquing. Let's not forget vintage clothing. If you're into collecting clothes from a bygone era, have your fashion tastes on full allert, and pick & choose among the offerings. Old crocks, storage jars, blackened cast iron cookware from the turn of the 20th century, along with an old coffee grinder and a vintage kitchen scale are offered by this particular vendor. Colorful soda fountain glasses and a mint green Hamilton Beach Drink Mixer (for delicious milkshakes) are so retro. Look at this set of turquoise Pyrex bowls in mint condition. I know of a few people who obsess over this hue. There's a hand crank flour sifter next to it. A six pack of old RC cola bottles and their original cardboard carrying case for the collector are pure kitsch. The square cake carrier, however, really got my attention. It isn't often that one comes across a square one; they are almost always round. The dome is chrome metal and the base is clear glass. There are locking mechanisms on the side. Imagine having this case loaded with your favorite brownies or a wonderful chocolate cake. Some wonderful opaline green glass, perhaps mid century (I'm not sure if they're French or not), is not expensive. 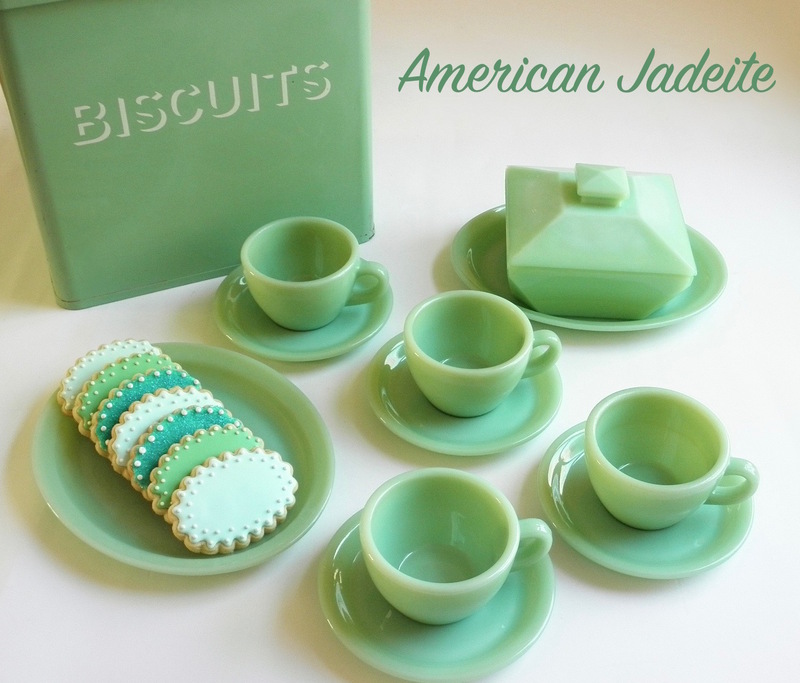 Thinner and more translucent than true milk glass jadeite, opaline glass is quite beautiful. I wanted this square Fostoria cake stand but there were two things working against me. The first was solving the dilemma of transporting it back to Philadelphia and the second was the hefty $170 price tag. Needless to say, I did not get it. Go back to my post on the Vintage Wilton Yearbook to see a beautiful cake sitting proudly on one of these glass pedestals. The shape and style of the stand has a small "well" in the center of the plate. I'm told that the "well" was designed to catch the brandy or other spirit used to douse a cake (probably a pound cake). I stopped in my tracks when I saw these stoneware bowls with blue bands. As I began to lift the set, I noticed how heavy they were for their size. I was curious, so I took the smaller bowl out and flipped it upside down. Much to my delight I read the imprinted logo of the Robinson Ransbottom Pottery company. The same company that produced the Great Big Mixing Bowls for Martha by Mail made this gorgeous set of stoneware. With the company no longer around, these cream colored bowls are very collectible in my opinion. And then we come to the Fire King jadeite and blue milk glass. 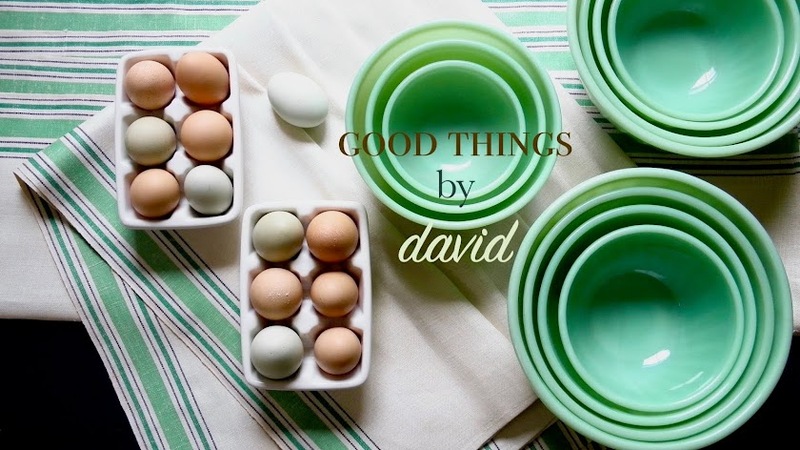 Batter bowls with handles, teardrop mixing bowls, chocolate mugs, refrigerator dishes, teacups, salt & pepper shakers are ready to be collected by the avid jadeite aficionado. More Pyrex and several Ball Jars & Mason Jars with screw & clip tops are great in so many types of kitchens. I passionately collect them. Silver. I adore it. I collect it. A treasure trove of spoons, forks, knives and servers are behind locked glass cases. It's always advisable to ask for help if you want to examine a piece closely. Tags will sometimes get flipped over and the price may not be visible. Don't be afraid to ask to look at something that catches your eye. That's what dealers are there for. Boxed sets are always nice to look at. That middle space is empty because I bought the beautiful set that occupied it. A few napkin rings are on the upper shelf along with some silver salt dips. In this general area there are many estate quality pieces for the collector. Glassware that is so collectible is neatly arranged by style and color. I had my eye on the ruby rimmed wine glasses, but again, I left them. I thought of someone who collects one-of-a-kind silver spoons when I saw this display. I was actually surprised at how inexpensive they were. A very nice assortment. The basement floor houses larger items such as furniture. Many toys & dolls are located in this area. A lot of this furniture can be purchased quite cheaply and be left as is or repainted to suit one's tastes. Be on the lookout for unique lamps and sconces if you're remodeling or decorating a space. I came across this steel pot rack which wasn't overpriced. Place it over a kitchen island and hang your pots and pans from it. These are a very good thing. Diner stools & tables, all in mint condition, are great for those who love this type of retro style. An old O'Keefe & Merritt 36" range with a back shelf and double ovens is just waiting for someone to collect & refurbish it. Many old stoves had printed cooking times & temperatures to help the housewife make effortless meals for their families. The O'Keefe & Merritt logo. A griddle in between the burners was meant to cook anything from hotcakes to burgers. If you look closely, the front burners have heat diffusers built onto the grates. The back burners are opened, not sealed. King Richard's is a must for those who love to collect. Going through this store is very informative, because one can gain a lot of knowledge just by reading the tags. Finding out what things are & what era they pertain to will make you a savvy shopper. Don't be intimidated by lack of knowledge when it comes to perusing any type of antique. Once you become a regular of antiquing it will be easy to walk into any antique shop confident and ready to be a discriminating browser or collector. In my opinion, King Richard's Antiques is a very good thing. Visit it if you're ever in Southern California. is it me or is there a lot of pyrex at that location? I like the light blue set the most. How much were they if I may ask? Stacy, there is quite a bit of Pyrex here. If you're into it, pay a visit & choose from the tons of styles/colors. As for the price of the turquoise bowls, I want to say they were about $70 or $75. Not at all bad.